2015 Delaware Limited Liability Company Act and Limited Partnership Act - Michigan Legal Publishing Ltd. 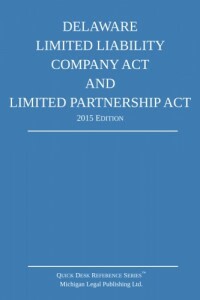 This Quick Desk Reference Series edition of the Delaware Limited Liability Company Act and the Limited Partnership Act contains the full text of Chapters 17 and 18 of Title 6 of the Delaware Code, including the Limited Liability Company Act and Limited Partnership Act, as amended through January 1, 2015. This un-annotated text is intended for quick reference of the limited partnership and LLC laws of Delaware. Delaware is the most popular location for forming LLCs and LPs in the United States. This text is perfect for the attorney or student who needs to quickly reference the statute text.